The ceremony of the sand is a precious ritual that represents the eternal union of the bride and groom. If you are looking for a special symbol for your wedding day, this is your winning bet. This ceremony is one of the most original ideas on your big day. Whether you are celebrating a religious wedding or a civil ceremony, this can take place before the wedding songs begin to ring in your party, surrounded by friends and family who will be excited to see you share this special moment. The origins of this tradition are not very clear, although most theories point to two different sources. The first version ensures that the ceremony of the sand has its origin in an ancient Hebrew tradition: the so-called “salt pact”. In the time of the patriarch Abraham, the salt pact was used to seal agreements, friendships and contracts. Each party carried a sack of salt and mixed them on the floor. This also meant that, once the salt was mixed, it could never be separated, becoming a covenant for life. Visit for more about ancient Chinese wedding ceremony. However, other historians claim that ceremony of the sand has its origins in the ancient Hawaiian weddings held on the beach. There, the sand sealed the union of the spouses. The bride and groom brought sandbars from their places of origin and mixed them as a symbol of union and eternal love, impossible to separate. You will need three crystal cylinders. You can use glasses or long neck vases. In two of them you will place the sand that corresponds to each one of you –it is very important that they are of different color. The third vessel will be in which each will introduce its sand to be mixed. It must be bigger than the two previous ones and with a wide opening to drop the two sands at the same time. If you do not use beach sand, buy crystalline quartz sand of two colors, which will allow you to see clearly how sand is left after mixing. If you use two types of sand of different colors, the result of the mixture will be very decorative. After mixing the sands, you can seal the jar, record your names and the date of the wedding in the bottle. Also, once used, the two other containers can be used to put fresh flowers after the ceremony. But like everything in your wedding, you can modify ceremony of the sand according to your beliefs and preferences. For example, some people add white sand to the bottom of the bottle as a symbol of the path you are going to take together. You can also leave some sand in your jars, symbolizing that, although from now on you are together, you will maintain your own personality. This type of ceremonies can be one of the many ideas for civil weddings. Another option is to give small bottles full of colored sand as a wedding detail to your guests. 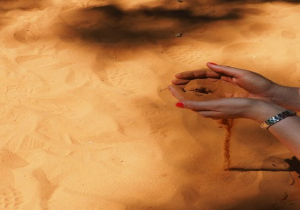 Filed under Blogging |	Comments Off on What is the ceremony of the sand?